Rising majestically above the Caribbean Sea with unparalleled views of the Pitons, Jade Mountain is an architectural marvel celebrating Saint Lucia’s scenic beauty. The very essence of Jade Mountain is the celebration of life and love so where better to spend that very special holiday to let go, reconnect and rejoice in your newfound togetherness. Set amidst a private 600 acre tropical estate with 2 soft sand beaches, Jade Mountain’s spectacular scenery, views and architecture is an unforgettable setting for a honeymoon, wedding, anniversary or simply for a romantic break you’ll never forget. With a dedicated Romance Concierge on hand to orchestrate all manner of romantic surprises, Jade Mountain will go to extraordinary lengths to provide the ultimate in service and privacy for this special time. Jade Mountain’s Celestial Terrace provides one of the island’s most scenic locations for a proposal, a renewal of vows, commitment ceremony or a wedding. Guests should make time to visit the organic farm and plan for a sensory tasting at Jade Mountain’s chocolate laboratory. Jade Mountain guests have privileges at sister resort Anse Chastanet where there are additional restaurants, a scuba operation and 12 miles of hiking and mountain biking trails amongst the remains of an 18th century plantation. Jade Mountain also offers half day, full day and sunset cruises on the private sailboat as well as on their 60ft motor yacht. But no matter what activities and services are on offer, most Jade Mountain guests find it difficult to leave the privacy of their suites. The suites, which are called sanctuaries are grand sweeping spaces where bedroom, living area and an extravagant private infinity pool glide into one another to form extraordinary platforms floating out into nature. With the fourth wall entirely absent, these sanctuaries are stage-like settings from which to embrace the full glory of St Lucia’s natural splendor. Each sanctuary comes with a private Major Domo providing discreet and attentive service around the clock. Request a “Chef on Wheels” and let the Executive Chef bring his exciting Jade cuisine right into the privacy of your sanctuary. Let the culinary team treat you to a sensational six course menu titled “ Six in Your Sanctuary”, with wine pairing created by the resort sommelier and served to you in your sanctuary. Ask for an acoustic guitarist to serenade you during dinner. Castaway Dinner for two on Anse Mamin beach, a private Champagne and lobster sunset sailing cruise on the resort’s yacht, or dinner under the stars on the Celestial Terrace. Togetherness can be celebrated in many ways and there is also the spa to consider! 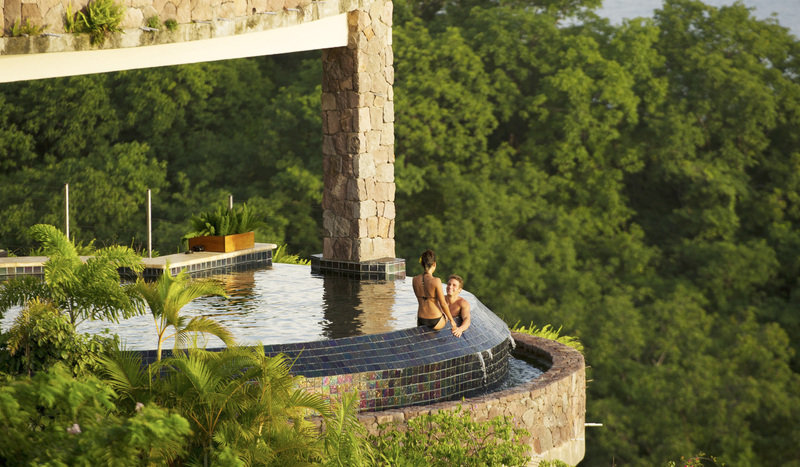 Jade Mountain offers a number of special spa treatments for couples. The Togetherness Massage begins with a “Loving” duet aromatherapy massage using Jade Mountain’s signature Loving Body Massage Oil, couples are then treated to a candle lit aromatherapy bath to enhance relaxation of mind & body. The ritual ends with a luxurious chocolate platter. Unsurprisingly, Jade Mountain is a beautiful setting for your wedding and, as the resort only celebrates a maximum of one wedding a day, you can be sure that your special day is of the foremost importance to the hotel’s wedding team. If you missed out on spending your honeymoon or wedding at Jade Mountain you can make up for it and rekindle the romance of these special moments by arranging the Forever You renewal of vows package during your holiday. And, if you haven’t yet popped the question, Jade Mountain’s Romance Concierge is on hand to help create a special surprise occasion for you to ensure your special moment is truly unforgettable and that the response is of course the one you want to hear! The SUMMER SANCTUARY: You can take advantage of a free 4th (4 nights for 3) and 7th night (7 nights for 5) in the Sky Jacuzzi suites and Star and Moon infinity pool sanctuaries. The offer is valid for travel from July 15 – October 15, 2017. The daily rates per couple in the Sky, Star, Moon categories respectively are: US 1,110 / 1,540 / 1,855. If a meal plan is pre-booked, then the free night(s) will enjoy the same meal plan free of charge. To add breakfast and dinner, please add US 200 per couple per day. To add an all-inclusive meals and drinks package, add US 360 per couple daily. All above rates – rooms and meals – are subject to 10% VAT and 10% service. There also is a special package promotion available for travel from July 15 – Oct 15, 2017, the ST. LUCIA SUMMER TOTAL ROMANCE PACKAGE, combining accommodation, meals, airport transfers, resort activities, excursions and spa treatments in one all-inclusive package. Book the all-inclusive Total Romance package in the Sky Jacuzzi suites and Star and Moon infinity pool sanctuaries for a 5 night stay and receive your 5th night free. Or, stay 7 nights, and receive 2 nights free. A 5 night stay on basis of this special summer promotion Total Romance package (5 for 4) is US 7,956 in Sky, US 10,020 in Star and US 11,532 in the Moon category. A 7 night stay on basis of this special summer promotion Total Romance package (7 for 5) is US 9,720 in Sky, US 12,300 in Star and US 14,190 in Moon category. The Summer Total Romance Package includes accommodation for specified number of nights in room category chosen; all-inclusive meal plan (breakfast, lunch, afternoon tea and dinner, most alcoholic and non-alcoholic beverages); all tax and service; airport transfers both ways; welcome cocktail, drinks package in room fridge, and tropical fruit display on arrival; bottle of French champagne; tour of Volcano, Sulphur Springs, and Diamond Mineral Baths; escorted walk of the Old French Colonial Plantation; guided boat snorkel trip; a resort scuba diving course for beginners or 2 dives per person for certified divers; a one-hour Swedish Massage per person; half-day Jungle Biking in Anse Mamin Valley; half-day sailing on skippered resort yacht Searenity; and 2 Resort T-shirts. Also included are use of tennis court/equipment, water sports equipment (snorkeling, kayaking, paddle board, mini-sailing, wind-surfing), beach chairs and towels, and complimentary resort water taxi to ANSE MAMIN beach. An anniversary certificate of US$ 500 to be used when presented to resort on a return visit. For more information or to book, contact your travel advisor or email the resort via jademountain@ansechastanet.com. Alternatively call us at Tel 1-800-223-1108.